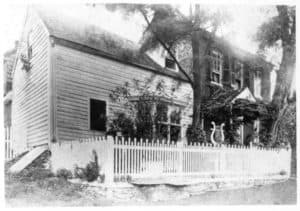 In 1799, when the elderly Thomas Moore died at his home on Bond Street (now 40132 Bond Street) in Waterford, Virginia, he was a long way from his native Waterford, Ireland-and at the end of an unusual life's journey. He was born to Quakers James and Amy Barnes Moore on the 19th, First Month (January) 1730, one of seven children. When Thomas was about 10, though, according to family lore, illness carried away his mother and all his siblings. His grieving father gathered up his remaining son-and James's sister Ann-and fled to the New World. Philadelphia Monthly Meeting-as that Quaker congregation was called-recorded on 26th of 4th Month (April) that it had received "James Moore, widower . . . from Waterford, Ireland." Father and Aunt Ann remained in Philadelphia for another 22 years, dying within three months of each other in 1762. Thomas was slower to settle down. Family records indicate he was apprenticed to a shoemaker and attended meeting-some of the time. But he also found time for non-Quaker amusements, and around 1754 he ignored his father's wishes by marrying a woman, Elizabeth, of another faith. The Meeting's censure was harsh: it disowned him. He left its jurisdiction, moving across the Delaware River to Trenton, New Jersey. Eventually, with the death of his father and aunt and the growth of his own family, Thomas had a change of heart. On the 29th of 4th Month, 1763, he and Elizabeth and at least three children petitioned to rejoin the Society of Friends-as the Quakers are formally known. Thomas presented a paper to Philadelphia Meeting acknowledging that "by neglecting the teaching of Divine Grace & following the roving Inclinations of Youth, he had transgressed the good order & testimony of Truth in marrying by a priest, contrary to his father's advice ..." The meeting embraced the prodigal son, noting that "a satisfactory account being received of his steady and circumspect conduct for some years past at . . . Trenton, there is grounds to hope his acknowledgment proceeds from a sense of his Error and a motive of sincerity." With Philadelphia's blessing the Moores were duly accepted into the Quaker fold in Trenton. By the 1770s, while the new United States was being born right around them, the Moores were back in Pennsylvania, shuttling between the Chester and Philadelphia Meetings. Daughter Amy married Evan Taylor from Chester, but he fell from favor of his pacifist fellow Quakers by hiring a substitute to fight for the revolutionary army. The meeting expelled both Evan and Amy. Eventually, in 1780, the remaining Moores-Thomas, Elizabeth, and five adult children-journeyed to the village of Janney's Mill in Loudoun County, Virginia, arriving in three separate caravans. The Moores' new home was named for Amos Janney, who had led pioneering Quakers from the Philadelphia area in 1733. Within a few years of the Moores' arrival members of the growing village evidently decided that it was no longer simply "Janney's Mill." The dynamic Moores undoubtedly persuaded them to rename the place "Waterford," after Thomas's birthplace. After the 1780s the old name disappeared from the record. The Moores went on to more tangible accomplishments in Waterford and beyond. Son Asa followed his father in the leather business, operating a successful tannery until his death in 1823. Asa's brother James went into manufacturing, including a woolen mill that did business with George Washington's nephew. Both brothers were founding members of the American Colonization Society in Loudoun County, a movement to colonize freed slaves in Liberia. Thomas's namesake, Thomas, Jr., went on from Waterford to become Virginia's chief civil engineer. He worked on the Erie Canal, among other major projects. He was also awarded a patent for the first "refrigerator," a name he coined. It was a lead-lined, fur-insulated walnut box that kept butter cool on the way to market. The Moore women also accomplished much. Amy Moore Taylor's daughter Rachel married Thomas Phillips, a prosperous Waterford businessman and farmer. Thomas Moore's daughter Ann married Methodist minister James McCormick; two of her children married well-to-do Alexandria merchant bankers, John Morgan and Joseph Eaches. Elizabeth, Jr., married the boy next door, Joseph Bond; their numerous children were active in civil and business affairs in Waterford through much of the 19th century. The author is indebted to the staff and their records at the Swarthmore Friends Library, the staff and members of Waterford, Ireland, Yearly Meeting, and descendants of the Moore family for helping clarify this history. Bronwen Souders is a member of the Foundation's Education Committee and has written or co-authored many publications about Waterford.